You can probably rattle off the names of a few dozen countries around the world. But can you name each of those countries' biggest brands? Probably not. And yet, many of those brands have more money and power than most countries. So perhaps schools should teach less geography, more global brands. This map is a start. The world has a new top brand. As recently reported by Fortune, Google has taken over the top spot from Apple. The search-engine-based tech giant saw its value increase by 24% last year, to $109.5 billion. But Google won out mainly because Apple's fall was even more dramatic. The iPhone company saw its value drop by 26%, to $107.1 billion. Amazon, the world's third-most valuable brand, is not far behind, at $106.4 billion. This map, based on data provided by Brand Finance. It reflects the global dominance of the U.S. economy – the next-biggest national brand is Samsung, the South Korean conglomerate, at $66.2 billion, less than two thirds of the size of Google (or Apple, or Amazon). Third on the list by country is ICBC, a Chinese bank, valued at $47.8 billion. Banks are the most prominent businesses on the map, topping the most-valued brand list in no less than 8 countries. Only one has truly global name recognition: Spain's Santander, the second-biggest bank on the map. The others are big at home, but less well-known abroad: the Royal Bank of Canada; Russia's Sberbank; Itaú in Brazil; and the acronymical DBS, QNB and KBC in Singapore, Qatar and Belgium, respectively. Hong Kong-based insurance giant AIA completes the financial services-segment. Despite the current slump in hydrocarbon prices, oil and gas companies top the list of most valued brands in no less than seven countries. The biggest one is Shell, based in the Netherlands and valued at $36.8 billion. Shell is more than triple the size of Eni in Italy or Petronas in Malaysia, and the rest of the oil-and-gas giants is valued in only single-billion-dollar digits: Mexico's PEMEX, Norway's Statoil, Thailand's PTT and Ecopetrol in Colombia. Each, however, is big enough to cast a shadow over any other company in each of those countries. Curiously, Google is the only internet-based brand on this map. The U.S. is way ahead of other countries in its corporate dominance of the online world (see also Apple and Amazon, for that matter). But in five other countries, the most valued brand emanates from the related telecommunications sector. Vodafone (UK) and Orange (France) are virtually the same size, and lead the list, followed by Telstra from Australia, STC from Saudi Arabia and Telkom Indonesia. Finland's Nokia and Taiwan Semiconductor are the only other brands directly linked to the ICT sector – of course besides conglomerates like Tata (India), which have their fingers in many pies. Perhaps the most recognisable brands are those that specialise in consumer-products. Cars, for example: Toyota, at $46,2 billion the highest-valued brand in Japan; and BMW, the richest German brand (at $37.1 billion). Or furniture (Sweden's IKEA, at $24.1 billion), toys (who doesn't love Lego, at $7.6 billion Denmark's highest-valued brand?) or even drinks like Red Bull (Austria's #1 brand). Meticulous shoppers will recognise the Nestlé logo on many of their food products, thus helping the Swiss company generate its $19.4 annual turnover. Emirates, the UAE's biggest brand, is also one of the world's highest-profile airlines. Less well known by the global general public are Falabella, the Chilean retail giant, and Medtronic, the Irish healthcare provider from Ireland. Brand Finance has developed a Brand Strength Index, which translates the varied expectations and opinions surrounding a brand, ranging from the value of logo recognition to the expectation of service a brand inspires, into a mark out of 100. The BSI measures marketing investment, market goodwill, and business performance of a brand. The stronger a brand, the closer it gets to 100. The further it gets from that maximum score, the bigger the trouble it is in – even if the finances don't say so. 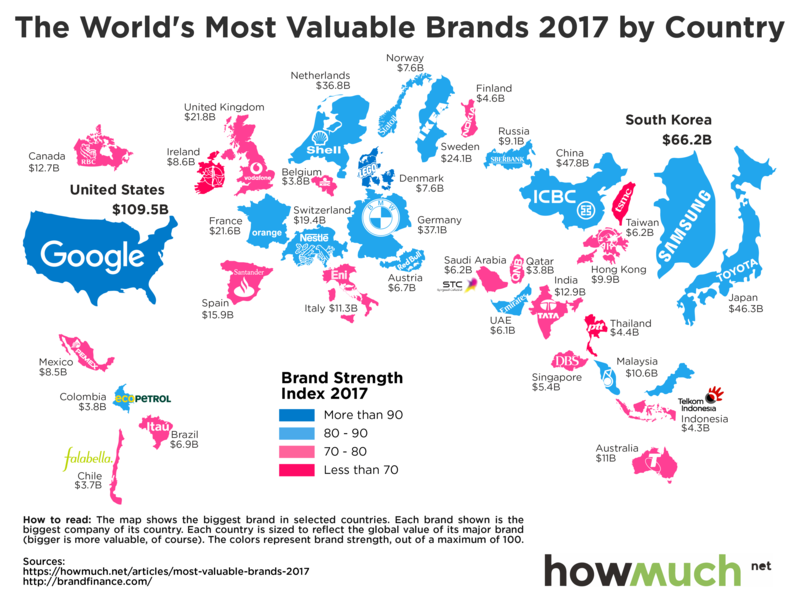 As indicated by its dark-blue color, Google, the world's biggest brand, is also stronger than all others on this map. Quite a few other brands, colored light-blue, fall in the second-strongest category (80-90), including Shell, BMW and Samsung. Less confidence-inspiring is the pink category (70-80), which includes Eni, Santander and Vodafone. Only a few market-leading brands have a strength index of less than 70, which translates into a crisis of confidence: Taiwan Semiconductor, and Thailand's PTT. As all of the brands on this map know, the market is volatile and their survival is precarious. Huge, wealthy brands can stumble and shrink to a ghost of their former selves. Take Nokia, for example: a leading manufacturer in the early days of the mobile phone boom, it almost went bankrupt in 2012. Finland's biggest company is still in the telecoms business, but doesn't make phones anymore. One major reason why brands rise and fall is the fact that their capital is more than just brand value – how much money they are worth – but also brand strength: a more ephemeral quality, linked to consumer confidence in the brand, but also the effect brand recognition has on investors, regulators, and the brand's own staff, among others. Correction 14th of February: STC's brand value has been updated to $6.2B.